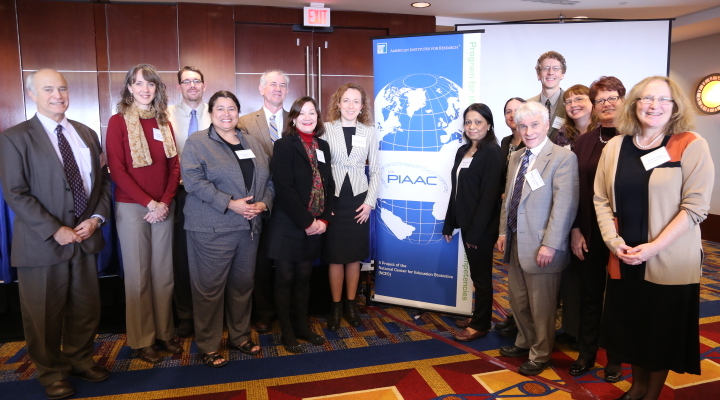 On December 11–12, 2014, the AIR PIAAC team was joined by more than 120 researchers, policymakers, and practitioners from the United States and six other Organization for Economic Cooperation and Development (OECD) countries—Canada, Estonia, Germany, Japan, Poland, and the United Kingdom—for the first U.S. PIAAC research-to-action conference: Taking the Next Step with PIAAC. The conference was made possible by a generous contribution from the Dollar General Literacy Foundation. The purpose of the conference was to advance both research and policy by sharing the results of research papers based on the PIAAC data with a broad group of researchers and policymakers. Eleven papers were commissioned by the American Institutes for Research (AIR) through funding provided by the U.S. Department of Education’s National Center for Education Statistics (NCES). To highlight the joint focus on research and policy, the conference began with introductory remarks by Peggy Carr, Acting Commissioner of NCES, and a keynote address by Johan Uvin, Acting Assistant Secretary of the Department of Education’s Office of Career, Technical, and Adult Education, that focused on some of the critical ways in which the PIAAC data are fueling new policies and programs for low-skilled, low-income adults. 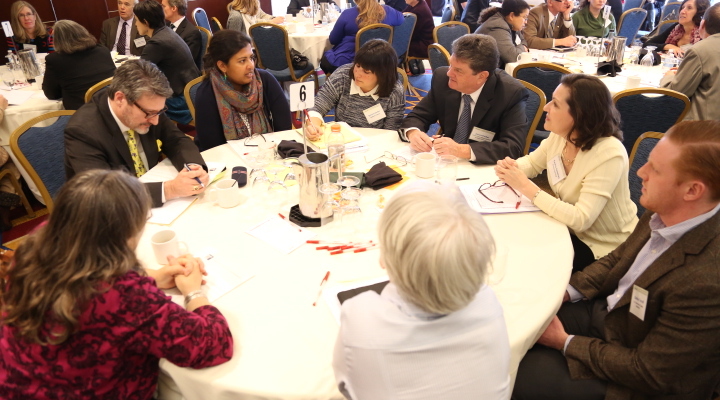 The day-and-a-half-long conference was divided into four sessions, each of which focused on a set of issues related to a key policy concern: the economy and the workforce, literacy and learning, the skills of immigrants, and health literacy. Each session began with the authors of commissioned research papers presenting key findings and implications for policy and practice; the presentations were followed by a discussion open to all conference participants. The participation of researchers and government officials from other countries provided a comparative dimension that enabled us to examine how changes in policy related to each issue might lead to improvements in the skills of U.S. adults. It was the consensus of the participants that the conference was an important step forward in bridging the divide between research, policy, and practice, but that there is much more to learn from PIAAC about the skills of our adult population and how we can improve them. We hope that all of our PIAAC Buzz readers will visit the conference page, listen to the videos, read the papers, and weigh in with their own research and policy ideas. Working together, we can make a difference. To encourage our readers to join us in exploring and sharing the PIAAC data, we are using the “Did you know?” section of the Buzz to launch a new feature that will highlight data from one or more of the research papers in each issue. The first installment of this feature is below. Immigrants lagged U.S.-born adults in terms of literacy and numeracy in English, with both groups scoring below international averages. More than 35 million U.S. adults demonstrated low English literacy proficiency and 58 million had low numeracy skills. U.S. average scores overall were only marginally affected by immigrants’ low scores. On February 17, 2015, ETS released a report called “America’s Skills Challenge: Millennials and the Future” that focuses on the PIAAC data for U.S. millennials (ages 16–34). Download the PDF report here: http://www.ets.org/s/research/29836/. In his State of the Union address on January 20, President Obama talked about the importance of “upgrading” the skills of American workers. The President was referring to a new federal initiative that focuses on helping workers develop the skills they need for higher paying jobs. The initiative will focus on four main avenues to enhance learning: more registered apprenticeships, more tuition assistance for postsecondary education, more on-the-job training, and increased access to technology-enabled learning tools. Most recently, the President announced the Upskill America initiative to enlist employers in this effort. According to the White House Fact Sheet, 30 employers have already taken on the challenge because they understand upskilling workers not only benefit their competitive edge, but also create a stronger economy and middle class. To read the White House Blog about the Upskill America initiative, click here. See a recorded video message from Acting Assistant Secretary Johan E. Uvin about the launch of the Making Skills Everyone’s Business report. The report describes potential synergy that is possible with the combination of the implementation of the Workforce Innovation and Opportunity Act (WIOA, PL 113-128), the Ready to Work report, and Upskill America that can transform adult learning in the U.S., build skills for the millions of low-skilled adults, and close the achievement gap for minority adults. What proportion of adults in the United States score below proficient in numeracy? Answer: Sixty-four percent of U.S. adults ages 16-65 scored at or below level 2 in numeracy, using the OECD definition of proficiency as level 3. The proficiency definitions are found here. What proportion of adults in professional jobs has literacy skills that are below proficient? Answer: Twenty-four percent of adults in professional jobs scored at or below level 2 in literacy, using the OECD definition of proficiency as level 3. The proficiency definitions are found here. What is the impact of parents’ education level on how well adults score on PIAAC in literacy? Answer: There was a 57-point difference in average literacy scores (233 vs. 290) between adults who did not have a parent with a high school diploma and adults with at least one parent with a college degree. This gap is significantly larger in the United States than the international average. How well do young adults in the United States perform relative to their peers in other countries in all three skills assessed in PIAAC? Answer: The average scores for U.S. young adults (ages 16-24) were lower than that of their international peers across all three skills assessed in PIAAC. The score-point differences were 7 points (272 vs. 279) in literacy, 22 points (249 vs. 271) in numeracy, and 10 points (285 vs. 295) in digital problem solving. What proportion of adults who work in the health care industry have low skills in literacy? Answer: Among adults who work in the health care industry, 50% scored at or below level 2 in literacy. Moreover, six out of fourteen major industries in the United States have higher concentrations of workers at or below level 2 than at level 3 or above in literacy. The Toolkit will help you address these and many other questions. It pulls together introductory videos, handouts, and, most importantly, a selection of PowerPoint modules that can be used to create customized presentations that focus on the data you may feel is most relevant to the community leaders and partners you are trying to reach. The PowerPoint modules are based on presentations that the PIAAC team has developed to share information at meetings and conferences. Over the past year, our researchers and analysts have looked more deeply into the PIAAC data, enabling us to offer more detailed and nuanced information about proficiency in literacy, numeracy, and problem solving; about the impact of parents’ education and socioeconomic status; and about the skills of our workforce. What Is PIAAC? This module is an introduction to PIAAC. Results Overview: This module provides a general overview of international and U.S. results. We’ve created three separate versions—focusing on literacy, numeracy, and digital problem solving—to provide more detailed information about each skill without making the presentation overly long. Low-Skilled Workers: This module focuses specifically on working-age adults (ages 16–65) whose skills are below proficient (that is, at levels 2, 1, and below 1). It looks at their demographic characteristics, the kind of work they do, the industries they work in, and the opportunities available to them for ongoing education and training. The Low-Skilled Workers module is available in literacy and numeracy. Sample PIAAC Tasks: This module includes a selection of sample tasks at each proficiency level for all three skills. You can choose illustrative tasks from this module to make concrete for your audience what performance at each PIAAC proficiency level looks like. Education and Skills Online: This module provides an in-depth look at the online assessment aligned with PIAAC that is currently under development. Education and Skills Online is expected to be available for use to assess individual skills this summer. Gateway & Other Resources: This module focuses on what’s available on the PIAAC Gateway. How can literacy programs do a better job of targeting those adults who are most in need? How can literacy programs build partnerships with businesses with high concentrations of adults with low skills? How can we ensure that the career pathways we construct to help adults move out of low-paying jobs build the cognitive skills they need to keep learning and keep up with change? How do we engage business and industry to build the skills of their workforce, including their lowest skilled workers? How do we make sure that everyone we work with knows about the PIAAC results and understands the urgency to act on them for the good of individuals, communities, our economy and our democracy? Look for the Toolkit logo on the PIAAC Gateway and visit our Toolkit page to find information you need to build awareness of the PIAAC results. Our team will be glad to work with you to develop a presentation that meets your needs. Free PIAAC training modules now available! Modules 1 and 3 provide important background information on PIAAC. Module 2 focuses on what is included in each of the PIAAC datasets. All researchers interested in working with the PIAAC data need to review module 4 before they get started; it includes information on the PIAAC sample design, weights, variance, and missing data and plausible values, all of which are important elements to include in any analysis of the PIAAC data. Module 5 includes training on the International Database (IDB) Analyzer, a powerful tool for analysis. Download and distribute our flyer here or begin your training or refresher course on PIAAC here. How to access and use the PIAAC U.S. synthetic restricted-use file that contains the restricted-use variables with mock data, expanding opportunity for researchers outside U.S. who would like to have access to variables such as continuous age or earnings in the United States PIAAC data. Check out the updated Datasets and Tools page for this and other information on PIAAC datasets. “What You Need to Consider Before Working with the PIAAC Data” is now available on the PIAAC Gateway at the top of the Datasets and Tools page. This short document provides researchers with the information and resources you need to get accurate estimates when analyzing the PIAAC dataset. Note to users: The OECD has identified an error in the derivation of the following variables in the PIAAC data files: NFE12JR, NFE12NJR, FNFE12JR, FNFAET12JR and FNFAET12NJR. Please go to the OECD website for updated international public-use files and SAS and SPSS scripts that can be executed to fix the problem with the current version of the files. NCES will release revised U.S. public-use and restricted-use files and an updated International Data Explorer shortly. If you have any questions, please contact: holly.xie@ed.gov. Every stage of development, deployment, and analysis of PIAAC has been a collaborative venture between the United States and our international colleagues in the OECD and the OECD countries. So we were delighted that researchers from several PIAAC partner nations—Canada, Estonia, Germany, Japan, Poland, and the U.K.—joined us for the first U.S. PIAAC research-to-action conference: Taking the Next Step with PIAAC. As we planned this issue of The PIAAC Buzz, we invited our international participants to share their perspectives on the conference and what is happening with PIAAC in their own countries. Here are responses from a few of them. My main interest at the conference was in the methodological approaches used to analyze the PIAAC data. Currently, in Poland, we are working on the post-PIAAC longitudinal survey, which uses a similar background questionnaire as PIAAC, and we are preparing the analytical approach for the new data analysis. In particular, I am interested in issues related to links between cognitive skills and the labor market, adult learning, and readiness to learn. The papers presented at the conference allowed me to see the diversity of approaches used by the different research teams. I was also impressed by the attention that PIAAC receives in the United States and could only wish for a similar level of visibility in Poland. Much of the reaction to PIAAC in England has focused on what it has to tell us about the deficiencies in our school system based on the finding that not only are England’s 16- to 24-year-olds falling behind their Asian and European counterparts in literacy and numeracy but that, as one newspaper put it: “England is the only developed country producing school leavers who are worse at maths and reading than their grandparents” (Daily Mail, October 8, 2013). It was reassuring then to join colleagues at the recent AIR event, Taking the Next Step with PIAAC: A Research-to-Action Conference, and be given the opportunity to consider a more rounded view of what we can learn from PIAAC. And the presentations made clear just how much there is to learn. There were many interesting concepts discussed by the presenters. In particular, I enjoyed the discussion around readiness to learn and the importance of skills use, which was highlighted by a number of speakers. I also felt that Stephen Reder’s conceptualization of a digital inclusion framework was insightful and of great use in thinking about the challenge presented to adult education by an increasingly digital world. Finally, I was pleased that a number of the papers focused more on the background questionnaire than on the performance data. PIAAC is a rich social science resource and should not just be seen as a measure of countries’ literacy and numeracy proficiency. The PIAAC data are potentially powerful, not when used to assign individual responsibility, but when they are used to call for systematic change. AIR has clearly been successful in ensuring that in the United States there is awareness of PIAAC across various government agencies. I left feeling optimistic and informed and hopeful that a similar level of engagement could be achieved in England. Thank you for the opportunity to participate in Taking the Next Step with PIAAC: A Research-to-Action Conference. We enjoyed being there, and it was a good opportunity for us to meet other researchers interested in PIAAC. We were amazed by how many researchers already use the PIAAC data to do very interesting research. However, many research and methodological questions remain open. This PIAAC conference confirmed our own research experience in this regard. PIAAC-L is a longitudinal study that we are carrying out in cooperation with the Leibniz Institute for Educational Trajectories and the German Institute for Economic Research. The PIAAC-L project will follow the PIAAC respondents and their household members over three further waves of data collection. The aims of PIAAC-L are, among other things, to enrich the range and context of the PIAAC data in order to allow for more in-depth and far-reaching analyses, to compare the national competency measures with the PIAAC measures for literacy and numeracy, and to explore the stability of the proficiency measures used in PIAAC. In a further project based on a joint initiative of Leibniz institutes in Germany, we will try to improve certain measures built into the PIAAC questionnaire, such as skill mismatch and adult education training. We will also look at how the proficiency measures are related to measures of intelligence. Further, we intend to link the PIAAC data to the employment history of the participants and research how these relate to proficiency. Using the PIAAC field-test data and the reading component measures, we are looking at individuals who are low in literacy. Our aim is to develop policy recommendations to decrease low literacy in Germany. This is a cooperative project with the University of Hamburg. We are also in the process of building up a PIAAC research data center to distribute the German PIAAC data and para-data and provide methodological support and training for the users of the PIAAC data. For more information on PIAAC in Germany, please visit http://www.gesis.org/piaac. England’s young people perform worse on the PIAAC survey than their grandparents’ generation. But if they stay on in education or get a job with training, they quickly catch up – hence, England’s average ranking. This points to the importance of successful transitions from compulsory school age to further education or employment with training. In England, 15% of those with poor literacy skills and 17% of those with poor numeracy skills had tertiary qualifications—the clear implication being that to maintain your skills at a good level, they need to be exercised and utilized. Ongoing engagement with adult learning and work-based training keep skills fresh and useful. England does have some striking advantages. The proportion of people undertaking work-based training and in tertiary education is relatively high. We have a good employment rate and, to end on a particularly pleasing note, our research base and policy knowledge in this area are seen as exemplary by other countries. To learn more about this event, go to https://www.ipsos-mori.com/newsevents/events/143/Improving-basic-skills-An-international-perspective-on-a-UK-dilemma.aspx, with links to presentations. Adult Health: How Is It Related To Literacy, Numeracy, Technological Problem-Solving Skills And Adult Learning? Click here to see all the sessions related to PIAAC at CIES. 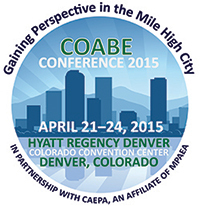 Access video recordings from the conference, the full research papers, and more! Country Reports: Austria and Denmark have released country reports. This volume introduces various methodological challenges encountered at different levels in implementing PIAAC in Germany. First, certain caveats associated with the PIAAC skill mismatch measure are discussed and a new approach for PIAAC skill mismatch measure proposed. The next article discusses the challenges in achieving compliance with the rigorous methodological PIAAC standards for the German survey operations. Another contribution presents results from an incentive experiment that was carried out in the German PIAAC field test to determine the best possible incentive for the main survey. The actual behavior of the German PIAAC interviewers during the interview is explored in another article, as well as the association of interviewer characteristics with data quality. The paper on nonresponse identifies the main factors that influenced participation in the first wave of PIAAC Germany. Finally, a non-standard estimation of the inclusion probabilities for the sample of PIAAC Germany is described. Use the PIAAC Outreach Toolkit to plan a presentation for a group you work with.